THE ORIENTAL RUG GALLERY LTD's shop and studios are centrally situated in the heart of Wey Hill – the vibrant Artisan & Craftsman quarter of Haslemere Town, in Surrey. Set within the Surrey Hills Area of Outstanding Natural Beauty, Haslemere is a picturesque town with a long-standing Artisan and Craftsman history, where distinguished artists, weavers, poets, authors and music-makers including: Tennyson, George Bernard Shaw, the Dolmetsches, Sir Arthur Conan Doyle, and George Eliot, as well as artists Helen Allingham, and architect Edward Lutyens, have chosen to live and practice their artisan crafts, through the years. The Peasant Arts Movement was founded in Wey Hill more than a century ago, by weaving artisans: the Blounts and the Kings. They taught the ancient crafts of yarn spinning and hand-loom rug weaving, while creating hand-spun tapestries and embroideries that are now held in the V&A and Haslemere Educational Museum. 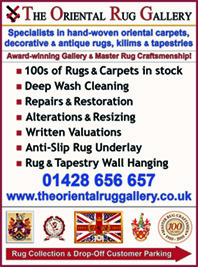 Garnering this artisan heritage, and as a family-run business of fourth-generation rug specialists since 1910, The Oriental Rug Gallery Ltd is established in the heart of Wey Hill, Haslemere, in Surrey, approximately 15 minutes from Guildford and just off the A3. due to our rugs' stocktaking and cataloguing works on Mondays and Tuesdays, we are now open: Wednesdays to Saturdays 10am to 5pm, where we look forward to your visits. Please note: due to the nature of our rug business, we may need to action extra rug works during opening hours, where we endeavour to keep these works to a minimum. 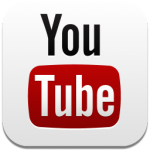 Our customers and rug visitors will be notified in advance, with the details highlighted as: text on the moving website messageboard (above); an audio message on the shop phone; and displayed as a printed message on the shop display windows. We apologise in advance for any temporary inconvenience these works may cause. 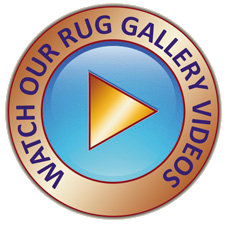 VISIT OUR RUG SHOP SHOWROOM AND STUDIOS! 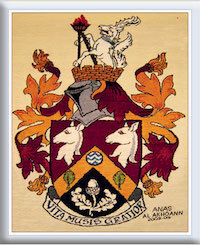 For an assessment of works and estimate of costings for any rug or tapestry repairs, restoration and alterations works, or rug & tapestry hanging, please see our Rug Repairs, Restoration & Alteration Services guidelines. 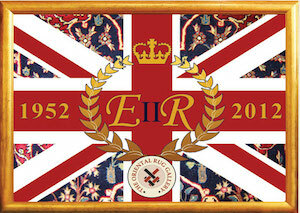 To view rugs of over 1m (approx. 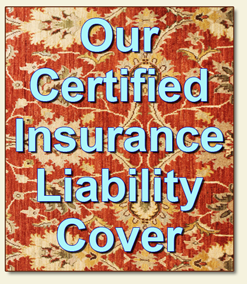 3') or more in length, please see our Rug Viewing Service guidelines. There is availability for customers' quick rug drop-offs and collections situated at the side of the shop – where we can help carry your rugs and carpets to and/or from your car! There is plenty of FREE customer parking on the Hill; next to the bank opposite; in the road opposite; as well the FREE Car Park at the top of the Hill – all within a few minutes walking distance of the shop. We can arrange to help carry your rugs and carpets to and/or from your car in the free parking areas near to the shop, if you let us know before or during your visit. 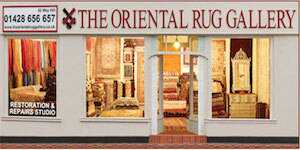 The Oriental Rug Gallery Ltd is located just a few minutes' walk from Haslemere Train Station. There is a direct train service from London Waterloo to Haslemere (approx.50 mins), from Guildford (approx.15 minutes), from Portsmouth (approx. 30 mins) and from Woking (approx. 15 mins). On leaving the station, turn right and follow the main road under the railway bridge and onward, passing St Christopher's Green on your right and leading into the parade of artisan shops and craft businesses that is Wey Hill. The Oriental Rug Gallery shop and studios are established at the heart of Wey hill, at the bottom, on the right. Exit M25 at Junction 10 (from London), onto the A3 towards Guildford (from London & Woking). From Guildford, continue south on A3 towards Portsmouth for approximately 20 miles until you reach the Hindhead Road Tunnel. Go through the tunnel and immediately take the first exit left off the A3, signposted 'Grayshott & Hindhead A333'. At the mini roundabout take the fourth exit on the right signposted 'Grayshott and Hindhead', taking you over the A3 road bridge. At the next mini roundabout take the second exit on the right following the A333 to 'Hindhead and Haslemere'. Drive straight along the A333 (Portsmouth Road) until you reach the traffic lights. Continue straight over the first mini roundabout, at the second mini roundabout turn right onto the A287 (Hindhead Road). Continue along for approximately two miles and stay left as you enter B2131 and feeding into the A287 for Wey Hill, passing the Esso Petrol Station & Costa on the left. Continue onward through traffic lights passing Lion Green and M&S Food Hall on the left. Pass through the next set of traffic lights to reach the heart of Wey Hill, where The Oriental Rug Gallery Ltd is situated on the left, with our parking immediate left after the shop, established opposite Haslemere Library and Santandar Bank, . Exit M25 at Junction 10 (from London), onto the A3 towards Guildford (from London & Woking). From Guildford, continue south on A3 towards Portsmouth for approximately 17 miles. Take the exit signposted 'Haslemere' A286. At the roundabout, take the first exit on the right onto the A283, signposted to Milford village and continue straight. At the traffic lights turn right, continuing along the A283, Portsmouth Road. At the next set of traffic lights, turn left onto Cherry Tree Road, (A283 signposted to Petworth). Continue to the roundabout and take the third exit onto the A286 signposted to Midhurst and Haslemere. Continue straight for approximately six miles, through Witley and Grayswood village and onward towards Haslemere. Proceed straight along Haslemere High Street to the Clock Tower and turn right into Lower Street (B2131). Continue for approximately half a mile, passing Haslemere Train Station on the right, until you arrive at the Wey Hill parade of Artisan shops and Craft businesses. As you descend into the heart of Wey Hill, The Oriental Rug Gallery Ltd is situated on the right, with our parking immediate right before the shop, established opposite Haslemere Library and Santander Bank. Continue north along the A3 towards Guildford. At the roundabout, take the second exit on your right and continue along the A3. Take the exit (slip road) on the left towards Bramshot Chase and continue around and down onto Upper Hammer Lane, until you approach the crossroads, (approx. half a mile). At the crossroads, turn left onto Woolmer Hill Road and continue straight past The Royal Oak pub on the left and up Critchmere Hill. Keep right as the road forks midway, heading towards Haslemere (B2131). Continue along Critchmere Hill road, until the end, where it meets the B2131 (the Hindhead Road) for Haslemere. Turn right onto the B2131 and follow this road down into Wey Hill, passing the Esso Petrol Station & Costa Coffee on the left. Continue onward through traffic lights passing Lion Green and M&S Food Hall on the left, and again through the next set of traffic lights to reach the heart of Wey Hill. The Oriental Rug Gallery Ltd is situated on the immediate left, with our parking immediate left after the shop, established opposite Haslemere Library and Santandar Bank. Route from Farnham using A287 (approx. 10 miles): On A287, upon reaching Hindhead crossroads continue straight over the mini roundabout and along the A287 (now the Hindhead Road). Continue for approximately two miles and stay left as you enter B2131 feeding into the A287 for Wey Hill, passing the Esso Petrol Station & Costa Coffee on the left. Continue onward through traffic lights passing Lion Green and M&S Food Hall on the left, and again through the next set of traffic lights to reach the heart of Wey Hill. The Oriental Rug Gallery Ltd is situated on the immediate left, with our parking immediate left after the shop, established opposite Haslemere Library and Santandar Bank. Route from Petworth, W. Sussex using B2131 (approx. 8 miles): From Petworth take the A272, past Petworth House heading towards Guildford. At the roundabout, take the first exit onto the A283 and continue straight for approximately 6 miles, passing through Northchapel village. Continue straight on A283 for another 1.5 miles then take the second left turning – the B2131 named as 'Rodgate Lane' (small sign seen on right as you turn left) to Haslemere. (The 'Haslemere' sign is immediately on left as you turn left into B2131, so difficult to see). The B2131 turning is also adjacent to signposts for Guildford/Chiddingfold & Northchapel/Petworth on the right. (If you arrive at Chiddingfold Village, you have passed the B2131 turning for Haslemere. Turn around on A283 and the B2131 right turn is clearly signposted approaching from this direction). Now. take the B2131, passing Lythe Hill Hotel (after 2 miles on the left). Continue straight for 1 mile into Haslemere Town and past the clock tower on the right. Continue along on the B2131, as it becomes Lower Street, for another half a mile. Proceed straight along Haslemere High Street to the Clock Tower and turn right into Lower Street (B2131). Continue for approximately half a mile, passing Haslemere Train Station on the right, until you arrive at the Wey Hill parade of Artisan shops and Craft businesses. As you descend into the heart of Wey Hill, The Oriental Rug Gallery Ltd is situated on the right, with our parking immediate right before the shop, established opposite Haslemere Library and Santander Bank. Route from Midhurst, W. Sussex using A286 (approx. 8 miles): On approaching Haslemere on the A286, turn left onto the B2131 (Lower Street). Continue straight for approximately half a mile, passing Haslemere Train Station on the right, until you arrive at the Wey Hill parade of Artisan shops and Craft businesses. As you descend into the heart of Wey Hill, The Oriental Rug Gallery Ltd is situated on the right, with our parking immediate right before the shop, established opposite Haslemere Library and Santander Bank.